Meeting growing postal challenges, while providing added control and convenience, encouraged Sexton Printing to work closely with customers and the Post Office to develop effective mail distribution strategies aimed at getting materials delivered quickly and cost effectively. Often the solution is not a single action, but a relentless pursuit of many small improvements along the process that make a big difference in costs, efficiencies, and speed of delivery. Today, the price of mailing magazines, journals, newsletters, catalogs, and other printed materials can significantly affect an organization’s bottom line. As a result, you (the mailer) need to take a more comprehensive look at your objectives—considering everything from the date a printed piece needs to arrive at its final destination to mailing frequency and format issues. Sexton Printing has been involved with mailing in many aspects for more than 25 years. Our niche has always been and continues to be publications, periodicals, and direct mail. We take a consultative and comprehensive approach TO EACH ONE OF OUR CUSTOMER’S COMMUNICATIONS NEEDS with an emphasis on PROPER DESIGN FOR PRINTING, as well as MAILING REQUIREMENTS. In addition, we evaluate the integrity of your list, checking for problems such as improper address formatting that can negatively affect mail processing. •	In order to receive automation discounts for either First Class or Standard Mail, mail lists must have been updated within 95 days of the mail date via NCOA, Address Requested, etc. 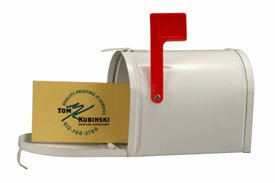 •	All zip codes on mailings must be accurate to qualify for presort and/or automation discounts. PAVE (Presort, Accuracy, Validation, and Evaluation) Certified Software is recommended. •	Carrier Route mail must contain addresses that have been successfully matched to the most current USPS national database using CASS Certified Software. Coding must be performed within 90 days of the mail date. •	For all other automated pieces, coding must be performed within six months. USPS-approved documentation is required in all cases. •	Sexton performs CASS Coding/DPV Verification for every mailing. •	BRC/Postcards—Minimum 3.5" x 5" and Maximum 4.25" x 6"
NOTE: What’s important today, in order to be machinable, is that the piece must be at least 7 points thick up to 4.25" x 6". Otherwise, you will lose automation discounts and pay a surcharge. Some 80-pound stock will satisfy this requirement, while others will need to be heavier. Please make sure to double-check this! •	Letter, No Folds—Minimum 3.5" x 5" and Maximum 6.125" x 11.5"
•	Letter, Folded—Minimum 3.5" x 5" and Maximum 6" x 10.5"
For example, a 6" x 9" postcard falls into the Letter category. NOTE: The piece must meet the aspect ratio (relationship between the height and width) to be machinable. Weight also is a factor and depends on the specific postal classification. •	Flat—Height: Minimum 5" and Maximum 12", Length: Minimum 6" and Maximum 15"
NOTE: A design must is a particular orientation between final folded/bound edge and any intermediate folded/bound edge. Thickness must be 3/4" or less. Weight for First Class =13 oz max, Periodicals = 20 oz max, Standard = less than 16 oz, Bound Printed Matter = 20 oz max. Sexton Printing offers complete in-house mailing services and we’re in compliance with the rules and regulations of reclassification. Most importantly, we’re fully committed to helping your organization develop an effective strategy to reduce mailing costs and speed delivery. We’ll maximize your presort discounts through our PAVE and CASS Certified Software, then ensure you gain all postal advantages possible. 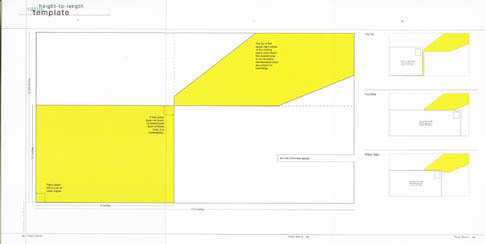 NOTE: We have a processing form that collects in-depth instructions for projects you feel need to be detailed. 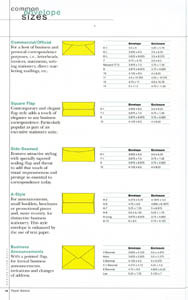 Here are some scanned charts of various envelopes along with their names, sizes etc. 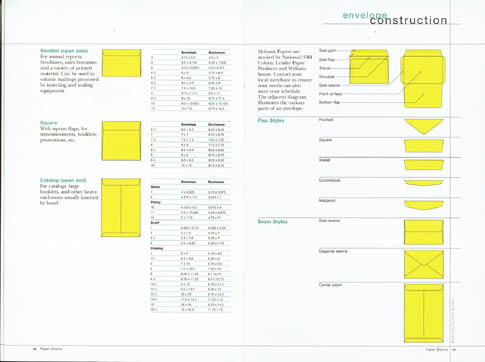 This may assist you with future projects and the inserted material sizing.